In 1910 Mexico celebrated the Centennial of the beginning of its War of Independence with Spain. To commemorate the event, a giant column was erected in the middle of Mexico City with a statue of "El Angel de la Independencia", "The Angel of Independence", sitting atop. This 6.7-meter statue, constructed of Bronze and Gold, represents the "Winged Victory", a Greek symbol for the goddess Nike (Victory). In her right hand the Angel holds a luarel crown, symbolizing Victory, while in her left she holds a broken chain, symbolizing Freedom. 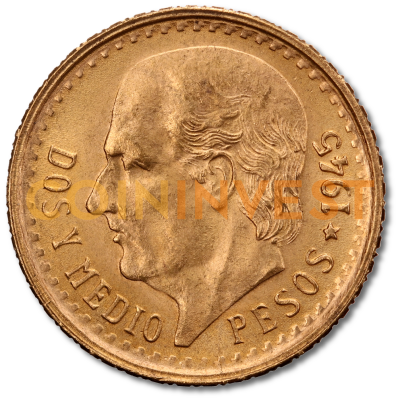 The Mexican gold 2.5 pesos used to be a very popular small bullion coin before fractional Krugerrands were introduced in 1980. Apart from investors and collectors, we used to sell large quantities to jewellery manufacturers for use in jewellery, particularly ear-rings, where their small size (13.0 mms), and low weight (2.08 grams) made them ideal. Dated from 1918 to 1948, the 1945 date is the easiest to find. We believe these are still officially restruck using this date.